Well hello again! Sorry that I had to take yesterday off, folks. It was a totally insane day at work and didn't have a second to rest until it was time for the my head to hit my pillow! But I'm back in action now! Now on to the good stuff... let's talk about the kitchen. I already know vaguely how I want to set it up. You can check out floor plans I whipped up on this post. On them you can see that the kitchen is pretty long and narrow and limits the lay out options. Long story short (ha) I was going to invest in a hutch. Since we're all Renters, we don't have the luxury of gutting the kitchen and setting it up in a more functional way. We've gotta work with what we've got! 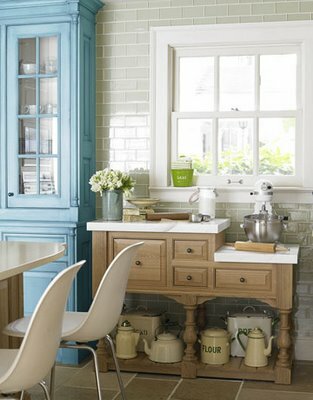 With a hutch, I could have some additional lower storage, that is narrow enough to fit in the kitchen and a can also display my beautiful copper pots. 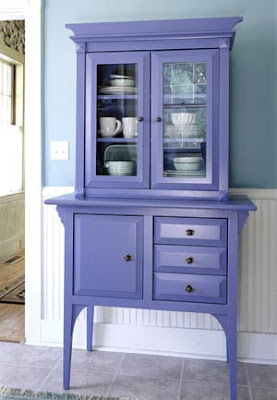 For some reason, unbeknownst to me, I have always visualized this hutch in blue. Of course I could always take an old craigslist find and paint it blue. Which I probably will end up doing. But just for fun, I did a little surfing to see what I could find that's already out there. And man-- I found some beaut's. Enjoy! This one is my all time favorite. The Robbin's egg blue is like summer in a can of paint! 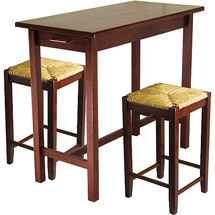 I love that it has the lower storage to hide things away, the upper storage to show and tell some cutie little nicknack's, but also has the curvy legs that pull it elegantly off the ground and make it look like a lighter, more delicate piece. Sadly, any hutch at all will be a late addition to the apartment. But that just means you get to see step by step how the place grows and changes! And isn't that what this is all about? Stay tuned for the reveal of the Plumage nightstand I'm working on! I was starting to get concerned that putting my roommates to the task of interviewing and solidifying a replacement for me was not in my best interest. I had gotten upwards of 25 emails regarding the ad that I had forwarded to them. They had only interviewed 5 and there was no discernible movement on it. Luckily, I got an email today telling me that they had a second interview with a girl that she has accepted their offer and are sending her the paperwork to get things started! I really hate all the financial hoops that we all have to jump through in order to get all this settled but they have to be dealt with. And when I started this, I told you I was going to take you on my journey of finding a new place and moving out. This ain't no "OC" here! This is the real deal, Folks. I'm just a girl tryin' to find some peace and a space to make all my own... and these are the things that we all have to grapple with in order to get to the good stuff. So I will wade through this annoying bit and write about it so we can all know that we're all in the same spot at one point or another. We've all panicked about not getting the place we want, or never having enough money or not being able to find your own replacement. It's just going to make that pot at the end of the rainbow that much sweeter. I want to hear about your hardest time moving. Was it a cross country trip? 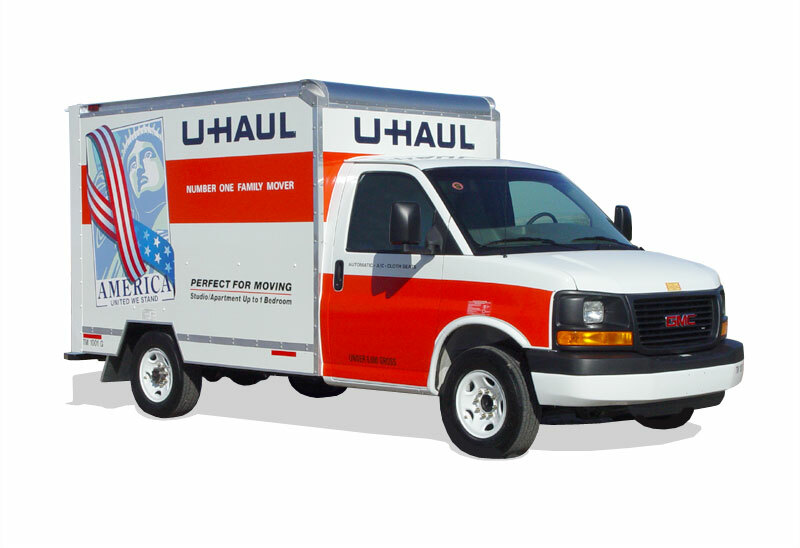 The movers never showed up? Couldn't fit your favorite couch up the stairs? Over the last few weeks since finding my new apartment, I've thought endlessly about the move itself. I anticipated being able to take my time and move slowly... after all, I have my current apartment until June 1st and my move-in date for my new apartment is May 15th. And that makes two luxurious weeks (NB: 3 weekends, the 15/16, the 22/23 and the 29/30) of moving. I thought I'd move the little, less necessary stuff first. You know, just a car load or 2 every night until finally the last weekend would be the big stuff... my bed, couch, dresser, etc etc. 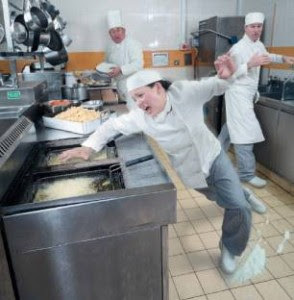 Pretty much, from there I'll do the exact opposite of what I was going to do. I have to get all the important stuff to the house immediately following. I think things will move along faster with this method. I guess, as it turns out life gets in the way of things like moving. But you just have to figure it out and keep truckin'! Stay tuned for all the great and messy packing pictures from Temporary Nest. Just this very morning my lovely sister-in-law, Molly, came to me with a Temporary Nest dilemma. She and my brother are moving into Manhattan from New Jersey. While they currently have a small 4 seater from IKEA, their new kitchen is apparently the size of a grand ballroom and want to expand their dining set. Molly loves to cook and bake up a storm and more importantly do those things for her house guests (I do get to benefit from this on occasion when I visit... YES!). 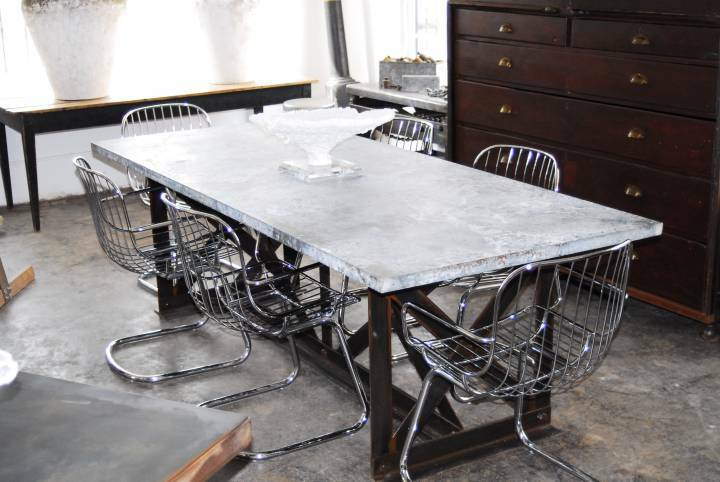 So she wanted to know... where could she find an old farmhouse, rustic looking dining table for cheap that will seat potentially up to 12 people. 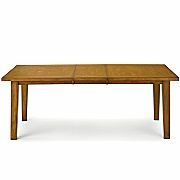 This is JC Penny's New England Table which is on sale for a mere $399 right now! Check for New, Farm House and Cheap! 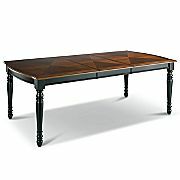 Or this Raleigh Table also from JC Penny and on sale for $439. While she thought these would be nice for someone else, she said she wanted something more heavy duty and to steal her phraseology, "weathered". What it came out to was that these were all too new! Keep in mind, finding a door may be only a part of the solution. 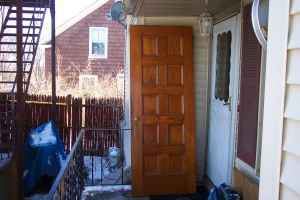 Most doors you'll find would be too narrow and not quite long enough for a 12 seater table. But you can always attach 2 doors together to make a larger more square table. 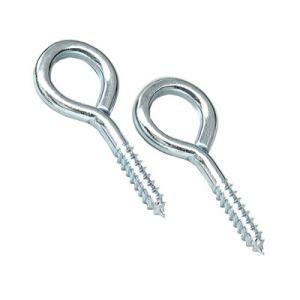 Grab a few L brackets from your local hardware store and screw the under side of the 2 doors together to the brackets and no one will ever have to see them! 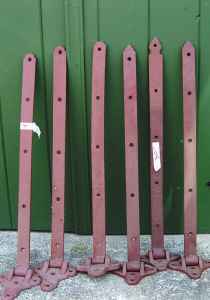 For added security and a great decorative feature on the table top, add a couple of these iron Barn Strap hinges across the break in the tables. They'll look cool and make it sturdier. 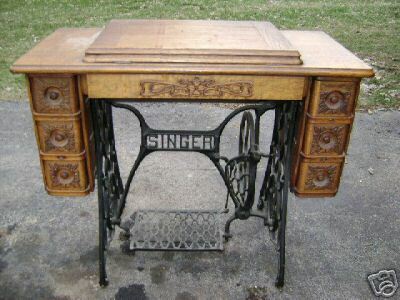 Also a Craiglist find, this could be made really interesting if you got 4 planks of wood and (perhaps with the help of a woodworker) adhered extensions to all 4 sides. 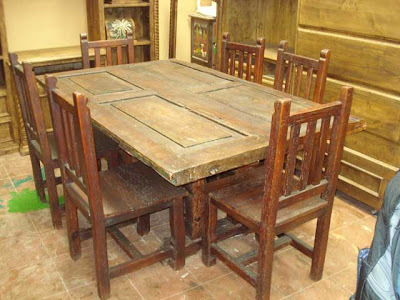 This would allow for extra interest in the piece with a change in wood grain or even stain color and texture, allowing the paneled door center of the table be its own piece of art. As for bases Molly suggested something cheap and easy from IKEA. But the visual weight of these legs vs the visual weight of the table top would look precarious at best. So I took her idea of the industrial look and ran with it. 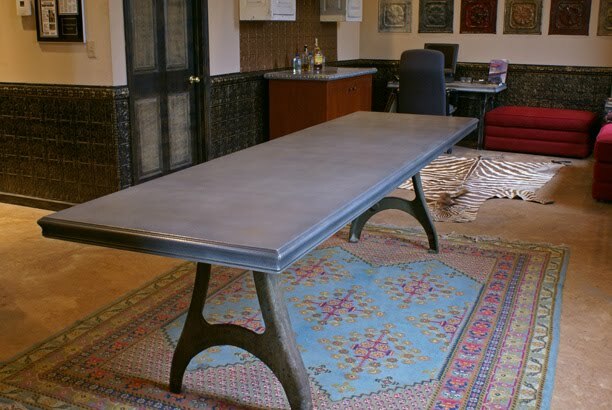 Looking up old cast iron table bases and legs and found these gorgeous zinc and pewter top tables with iron bases for sale. Aren't they both brilliant? Of course they are both insanely expensive and therefore does not fulfill key word #4: Cheap. Bummah. That's when I had my epiphany. Where can you find funky, interesting but fairly uniform iron bases everywhere and on the cheap? 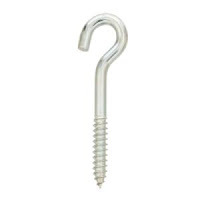 They all are approximately the same height and people are constantly selling these on Craigslist for next to nothing! Just detach it from the base of the sewing table and screw it onto the new door or table top of your dreams! 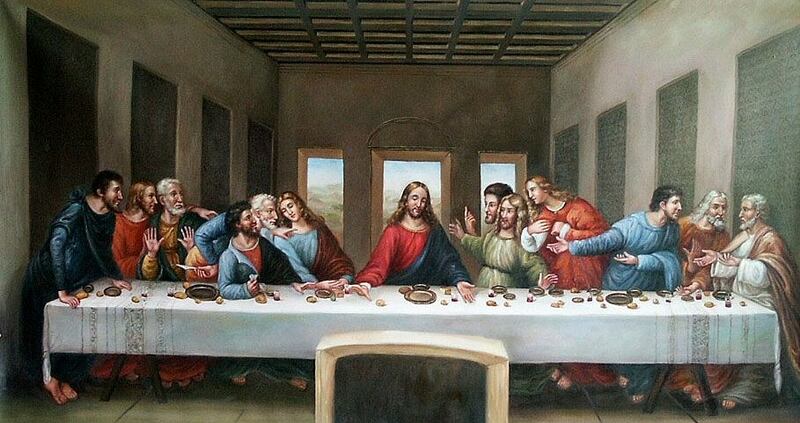 Depending on how long the table is, you may want one at each end. 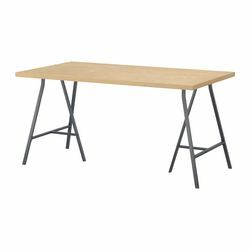 If its a little too low for your liking add a brick of wood between the table top and the base, no one will notice it since its under the table! I can't wait to see what the end up with! They have been sweet enough to invited me to their new home (once they move in of course) to help them decorate and photograph the transformation for your viewing pleasure. So, hopefully we can all see the craftsmanship that comes out of their new inspirational space! 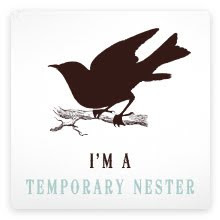 Stay tuned for more ideas from Temporary Nest! So I made a little trip to Target today and found a million things that I wanted to buy. (But doesn't that sound like every trip to Target?) I may have walked out empty handed but I also walked out riddled with ideas. 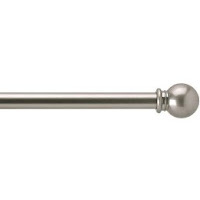 I decided to wait until I move in to my apartment before I buy a million decor doodads. It ends up just being more to move! I know that I have shown you all piece by piece how my room will shape up... but with my new-found inspiration, I whipped up a little mood board to show you how the major elements of my boudoir that will all come together. 1) The white, gauzy Wilma curtains are $9.99 per pair from IKEA that I already have 2 pairs. Gotta use what I already have, right!? 2) I already have a set of white 600 Thread-count sheets from Target but I want to get an additional set also from Target by the brand Springmaid in Sea Mist to bring a little more color into the room. I have a tendency to make everything white or ivory (maybe by the influence of my career?) and I need some color to brighten up the place! 3) I'll keep things clean and get a tailored bed skirt (From where?? Oh yeah...Target of course!) to hide all that junk I store under there. 4) Everyone's well aware of my beloved yellow IKEA dresser that they don't make in yellow anymore. Boo! 5) I loooove these curtains. They are a gentle chiffon sheer and are another element of added color to the otherwise bland room. I would love to get 3 panels of these and layer them between the 4 white panels creating this texture and color variance and keeping the window treatments interesting! 6) You remember my duvet-aholic tendencies don't you? Cant wait to dress my bed up! 7) I have the worst affinity for faux shag area rugs that I almost hate to admit it. I really love the texture this rug brings into the room. Hopefully it could take the attention away from the wall to wall carpeting throughout the bedroom. 8) And finally, you can find this optic sea glass lamp at Crate and Barrel. I had the luck of finding two of these exact same lamps in clear glass from Christmas Tree Shops for a mere $20 each. Which will go on my 2 nightstands on either side of the bed. 9) Lastly the background of the mood board is Vincent VanGogh's Almond Blossom print which I got for ridiculously cheap from Poster Revolution on Amazon. I can't wait to get this all together and be able to show you the vision I have in my overly enthusiastic brain. 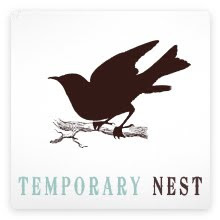 Stay tuned for more from Temporary Nest! He laughed and told me he had just put that out not five minutes before because he forgot about it and said "How's 2 bucks?" I thought he was joking at first, and I told him I only had a 5 and he promptly offered me change! So about ten seconds later, I was two dollars poorer, hauling off this deceivingly heavy nightstand into the back seat. The other bonus is that he had already primed it but hadn't gotten a chance to paint it yet. So half the work is done for me! YAY! I just need to add the high gloss spray paint so it will be uniform with my current nightstand. I love that they will both be the same color and high gloss but will be different. They almost look "His and Hers" don't they? I'm happy I'll have a little spot to put my latest book or foodie magazine. And when Matt says over, he will have his own spot on his side of the bed. 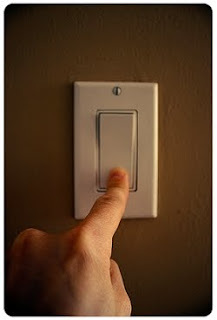 Not to mention, this means I will be able to turn the lamp off before I settle in for the night without having to actually get out of bed, the way I do now. Woo! Stay tuned to see how this new project turns out! I know its late but I just had to share a fantastic find with you. I know... I know... 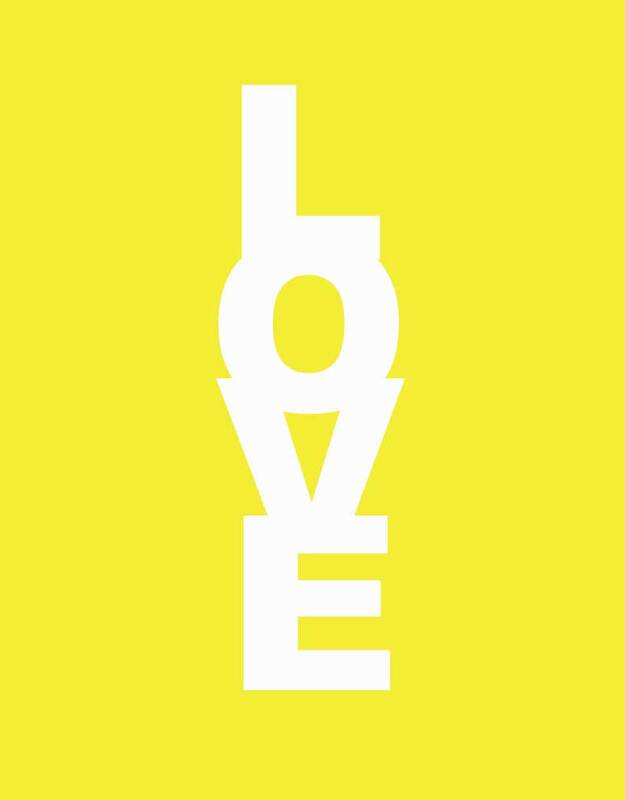 I have an unwieldy obsession with yellow and its consuming my life and more importantly my decor. 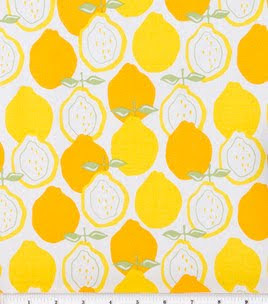 Despite this, I'm going to add a little more to my lemony collection. I found this precious website called The Beautiful Life. They have lots of great home accents that are reasonably priced and really funky and almost all have a Parisian essence to them. (And another thing besides yellow that make me happy as a school girl are vintage Parisian-style items. YAY!) 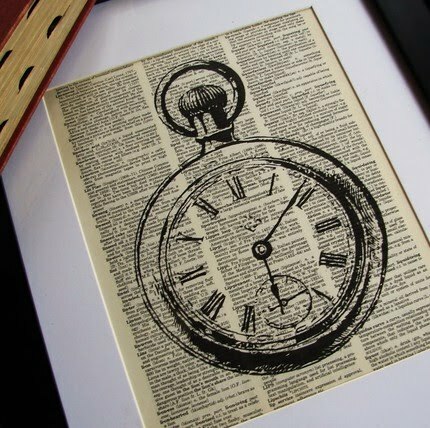 While perusing this site, I came across this amazingly simple print by Sweet Tart-art in the sale section. While I believe $20 is more than reasonable for this piece of art... I also thought I'd be able to make this myself without a problem for free. So busted out the Adobe Illustrator and I did! I'm a lucky gal for many reasons but this time I'm lucky because my dad works for a prominent printing company and will print a high quality copy of this for me to frame. I am going to flank this with 2 of these canvases that I wrote about DIYing in this post and hang these over the kitchen table! I'm thrilled to see how it is going to work out! I think it'll be warm and lemony and inviting! Sometimes I feel like all I write about are the things I want and less about the things that I or other people or our planet need. Since I was a little girl, I have always been a patron of consignment and thrift stores. As a growing kid, my mom always made me clean out my dresser and decide what was going to stay, go to consignment or go to Good Will. And you bet, I still swear by that today. (It goes nicely with my hatred for clutter.) Since today is Earth Day, I wanted to share a couple of thoughts with you all and hear what you have to say about it! 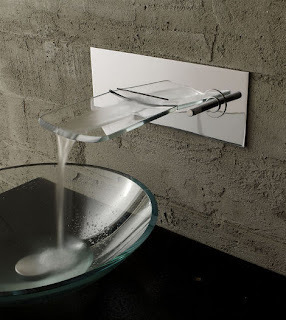 Don't leave the water running while brushing your teeth..
All of us Temporary Nesters can all do our part in keeping things green for our Mother Earth, even when decorating our apartments. 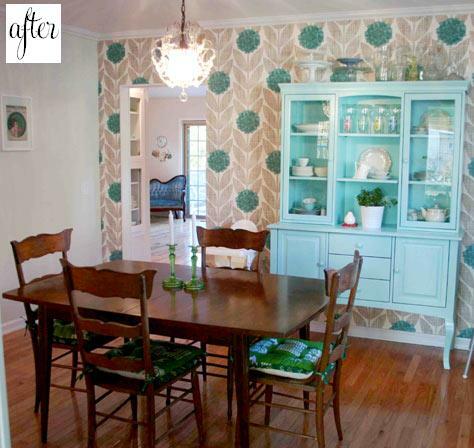 Buying furniture from consignment shops is a great way to re-purpose old furniture! In fact, check out this gorgeous little cedar chest from a consignment store nearby that I hope to pick up this weekend to use as a TV stand! 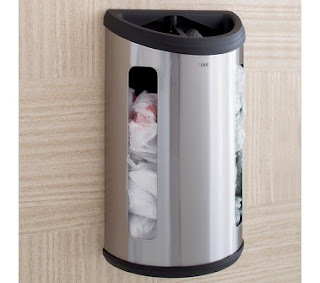 Crate and Barrel also rolled out their Earth Day email this morning and they have some great items, including this wall mounted plastic bag holder that would look snazzy in anyone's kitchen and will give your shopping bags (when you're not making use of your reusable ones like these hot bags) a nest of its own! There are so many ways to keep our Earth green and healthy, if everyone does their part we can all be proud Nesters. What did you do on this fine Earth Day 2010 to help out? Walked to work instead of drive? Took a shorter shower? Let us all know and share your ideas with us! Stay tuned for more Earth friendly tips on recycling reducing and reusing! 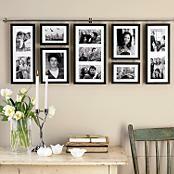 Now, this Hall Gallery Frame Set is the one I love but its kind of pricey. This and its other gallery frame family members: Delux and Wall, range from around 65 buckeroos to around 90. Yowza! For a frame?! I know. Its crazy. So I'm thinking of takling this concept on my own. With all of these elements combined ...along with some geometry skills to figure out how to balance them and make them hang straight, I think you could make your very own Hall Gallery Frame Set for well under $90. So, whattaya think? Worth a shot? Any frame builders out there in readerland willing to give us a few tips? I have officially worked myself into a tizzy. 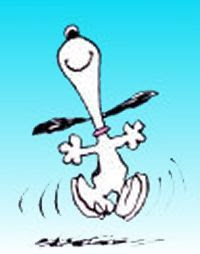 I am so ravenously excited about the move that I am completely jumping ahead of myself. If you saw my layouts in a previous post, you would have seen that they all included a full household of furniture. The kicker? I don't actually own all of it yet. In my imagination however, I have a deep mocha colored storage ottoman or coffee table, matching TV stand with glass paned windows, kitchen table with expandable leaf and the robins egg blue hutch of my dreams. I do have an adorable little two-seater dining set I got from Walmart last year. But its not quite up to snuff compared to the pricey list I just rattled off. I got this on the heels of getting my white couch. I had asked the roommates not to eat on it, and in turn bought this dinette set to give them an alternative place to eat. What a nice roommate, right? Well... my good intentions went unseen and Matt and I are the only ones that eat there. Historical data aside, I will use this in the kitchen of the new place for now. But ever since this moving adventure started, all I have wanted was to gather my friends and family around a big table and cook a lavish meal for them. And, well, I wont be fitting many of them around this little hunka-wood, will I? So the hunt has started for a dark wood rectangular table with a removable leaf and 4 chairs all under $200, and let me tell you... that's a tall order. It's back to the books for this girl! And this dining set debacle is just the tip of the iceberg, so if you find any good deals on any of aforementioned furnishings, leave a comment with the link! Stay tuned for more on the moving and copious online hunting. Today I'm going to take you on a little journey across the states of Masachusetts and Connecticut and onto a little island affectionately called Manhattan. My good friend and co-worker, Casey, is being relocated to our company's NYC office. While we're sad to see her go, it was a long time coming, she's been doing double duty, spending just about every other week crashing on her cousins couch in Brooklyn and hoppin' on the train to come back and work here in Beantown, too. Now that she is officially going to move to New York she needed to find a place. Casey quickly scrambled to assemble what was almost like a weekend of speed dating... only for apartments. Between fashion shows and travelling, somehow she managed to find and fall in love with a beautiful apartment on the Upper East Side. Here are a few on-the-go (read: blurry) photos Casey took of her new home-sweet-home. It's got the pretty standard NYC tiny wall kitchen. 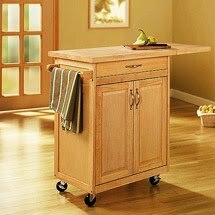 Luckily Casey and I both had the thought of adding some kind of island to create additional storage and a work station. I told her if she got my beloved yellow island I would be totally jealous. So after some discussion she decided to go with this puppy from Walmart. Many NY apartment owners try to utilize as much space as possible. Some put the refrigerator in the living room, some dont have bathroom sinks! But this one luckily only has one kind funky shaped bedroom which could be hard to decorate. Luckily Casey had it all figured out by the time she was showing me the pictures! If you notice, the wall in th right side of the picture narrows, leaving an alcove perfect for a workspace. The larger portion of the room will house her bed and dressers and the like. 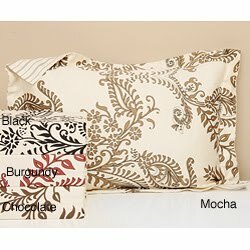 Again after some discussion and link emailing... we both agreed that this lovely duvet in black from Overstock.com is the front runner candidate for her new boudior. We love the way its going to look with her black and white photographs hung in her room. 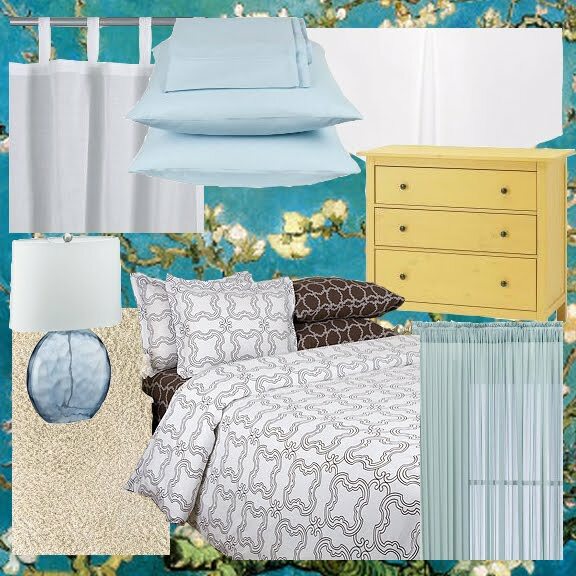 While Casey is prone to sticking to black, white and brown tones in her clothing (perfect for a Manhattanite) she has been branching out as of late and this bedroom will be no stranger to this as well and shes going to get a bright colorful throw pillow or two. 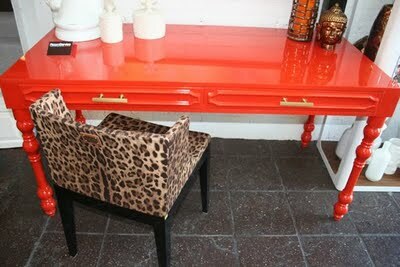 I also suggested getting a lacquered Revlon red colored desk with a funky desk chair to tie in her black and white (plus the splash of color!) theme. I would love to see something like this in that little alcove. Well there you have it Folks, the second in our NYC edition of Temporary Nest. If you missed it, you can read the first one here at my Dads house. I have been thinking about layouts for the house non-stop. Having not gone into the apartment since I first saw it, I just used my (not-so-great) memory to draw up a couple lay outs of the place and possible furniture lay-outs. When I get in there and get some measurements I can rehab these babies and make them more proportionately accurate. So take all these with a large grain of salt. I'm sure when I get those measurements in here it will look a little less spacious but hopefully not too much less! What do you think? Which lay out do you like? Or is there a bedroom/living room combo you would like to see better? Any Feng Sui advice? My new apartment has one overhead light in the place-- in the kitchen. Kind of a bummer but I also don't use overhead lighting much anyway. I find that light from carefully placed lamps creates a much warmer, cozier ambiance. And that also means that I get to amass an even larger collection of lamps than I already have. YESSS! I took a little preemptive trip to Home Goods on Tuesday evening and fell in love with a few lamps there. I held back from a purchase figuring that it was a little more than I had wanted to spend and I also don't want to buy more things that I am just going to have to move anyway. 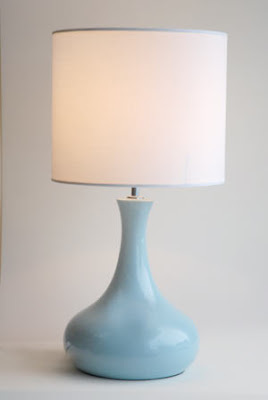 If its meant to be one of my beloved lamps will be there by the time I move in. This has also spawned me to do a little online browsing. 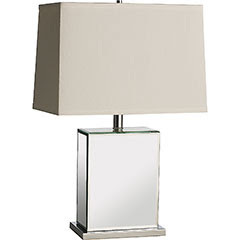 This is a mirrored lamp from Pier One Imports which I was mentioning in yesterday's entry. The greatest part is that this lamp is on sale! 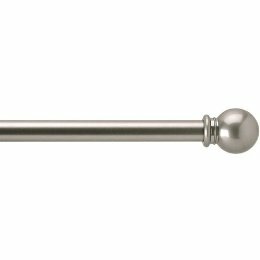 Originally $99 its now $49.48! SOLD! I imagine two of these would look incredible on two night stands on either side of my bed. Originally, I had wanted something more like this. 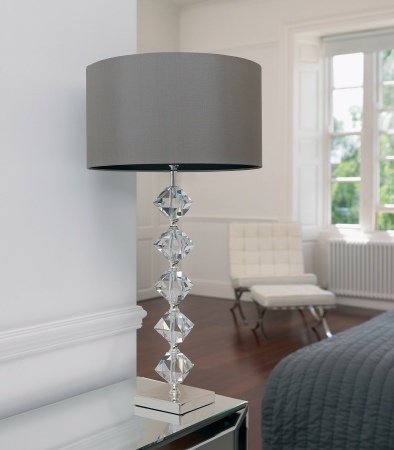 Add a little "bling" to the bedroom. I adore this gray shade with it, taking it form being uber girlie to chic and gender neutral. Straying from the neutrals and all those plain Jane lamp bases this is a fantastic way to add some glorious color into your house. This is much like the lamps I am in love with form Home Goods. Its simple and retro and colorful! Need I say more?? Although this is a terrible resolution image, I couldn't avoid putting this in this entry to show you. These shades blow my mind. Taking a simple base that you could find something comparable at Christmas Tree Shops and adding a funky plaid shade and pairing them with some colorful artwork. 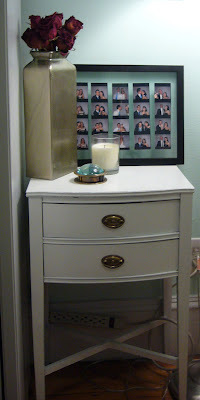 It makes the perfect little vignette for an entryway. Lets see if I can decide which style to take home once I move in. Stay tuned to see how it turns out! Priscilla Of Boston Fashion Show!